Forklift portable for easy handling of loads up to 4,000 lbs. Rugged construction features stand up to heavy industrial requirements and prevents product damage. Save time by moving more material with fewer moves. Side and end frames are available to prevent load shifting. Prices listed are for base frame style 4. For other base frame styles and/or decking options, i.e. plywood, sheet metal, expanded metal, etc, call for pricing. Standard color - Blue. For 10 or more base frames, contact Material Flow for additional bulk discounts! 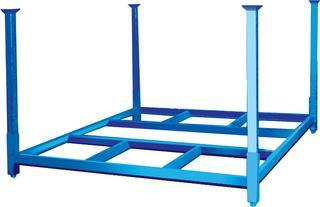 Corner Posts for Stromberg Portable Stacking Racks. Sold in sets of 4.